Seasoned traveler and adventure-seeker Tim Cahill has a story in Hold the Enlightenment about hiking into the dense rainforest on one of the Queen Charlotte Islands off the coast of northwestern Canada. He fell down a mossy cliff and cracked open his head. Knowing that he’d never be found if he rested on the forest floor, he bandaged his head and staggered down to the ocean, and swam around the island towards the camp he and his companions had kayaked to. They eventually found him as he was on one of the rocky points, trying to gather wood for a signal fire, and he lives to this day to tell the tale. When my wife and I went to the island of Taveuni in Fiji last year for our honeymoon, we went on a guided forest hike that ended at the Wainibau Waterfalls. 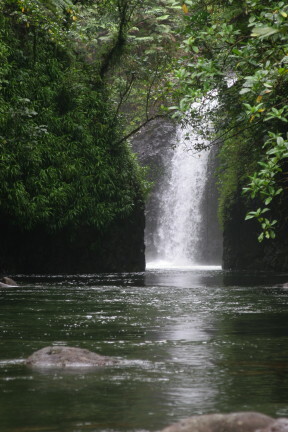 At first glance it was the epitome of our imagination of the hidden jungle waterfall, beautiful and peaceful. However, this idyllic spot exists because of a very real, and very serious, set of natural circumstances. There are actually two waterfalls that come together from different heights to form one pool, the flow of water quite strong from both. Over thousands of years, their combined force carved a deep bowl into the forest floor, and their offset direction creates a whirlpool. The walls of this basin are black volcanic rock, sharp and slippery. Besides admiring the beauty of the spot, one might ride down the lower waterfall as if on a waterslide, or jump from the top of the upper waterfall. I chose what seemed the less crazy of the two, and scrambled up the black walls behind our guide, and sat in the waterfall and let it carry me over the edge. The exhilaration lasted a full 5 seconds before panic set in as the force of the water drove me 20 feet below the surface and the spin of the whirlpool carried me to the wrong side of the bowl. The guide jumped in and joined me, revealing the trick to getting out – to swim toward the waterfalls, then dive straight down about 8 feet, then about 10 feet under them and towards the far side before returning to the surface. I didn’t swim far enough, and when I surfaced the whirlpool carried me back to the far side. I tried again, and failed again. Back on the wrong side, I was anxious and tired. I couldn’t rest because there was nothing to hold onto, forcing me to expend energy treading water. I tried to remain calm, even as I knew I had only one more try left in me. I waited a few moments, focused on my breath, sighted the far side, and then swam, dove under the waterfalls, swam further underwater, surfaced, and finally made it. Had I failed the third attempt, the guide would have rescued me, but all I felt at the time was do or die. Adventuring has inherent risk that we all accept in theory, but the real test comes when the unexpected actually happens. No matter the situation, the key is always to remain calm, think through what has to happen, and then do it. These experiences, whether “near-death” or not, serve as a wake-up call to not take things for granted and to see past first impressions to the reality behind them. They serve as a test of our ability to remain calm and think ourselves out of a corner. What death-defying experiences have you had, and how did you get out of them? Well, while you and the guide were having a grand old time jumping and sliding down falls and not dying, I was doing my best to not die, too! Being a strong swimmer, I was getting restless just hanging on the wall and waiting for you. I decided to let go and tread a bit, maybe see what you were up to on the other side of the whirlpool. I was quickly swept under, mere inches from the wall. I kicked as hard as I could to no avail, so I scrabbled to find a hand hold on the rock. Having had both of these methods fail me, and the oxygen in my lungs giving out, I was about to resign myself to the abyss. It was then that the laws of fluid dynamics finally worked in my favor, and I buoyed up to the surface. I gave a quick smile and wave over to your side, my hubris not allowing me to admit that the water had nearly beaten me. I’d like to think that the guide would have come and saved me if all had gone wrong, but with both of us in danger at that critical moment, and the extreme power of that water, I really don’t know. I’m so glad we both survived our honeymoon! Waterfalls are my favorite natural phenomenon. They’re ridiculous dangerous too. In Australia I lived in a hostel with a couple of English guys, and we made a stupid pact to never miss a day of surfing – no matter what the ocean was like. One day a hurricane warning was issued, but myself and one of the other guys felt compelled to go out anyway, for some inane testosterone laden reason. The ocean was brown and foamy and totally nasty. Within moments I found myself struggling for my life. I got so thrashed by the first wave I caught, and it held me under for so long, that I was sure I wasn’t going to make it. It was like being trapped in a dirty washing machine full of water, spinning all around for what seemed like endless minutes. I just popped my head out of the foam long enough to grab one breath before being slammed back down by another wave… and I knew it was over. I had this sort of peaceful feeling of acceptance just start to come over me, when suddenly I was slammed by my board, grabbed it in a death grip, and was launched into pure, sweet air. I had settled into a miraculously tiny little smooth circle of water between waves, and scrambled to lie on my board and just paddle face down on the next wave which launched me right back to shore in a surreal haze of salt spray. My friend appeared on the beach shortly afterwards with half a surfboard – his had been shattered. We both just looked at each other and realized what a bunch of idiots we were and humbly walked back to the hostel. I still have no idea how I survived. I credit it to just having to believe God wanted me to live another day, is all.